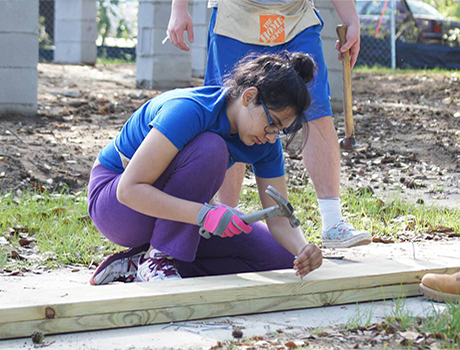 Maira got very familiar with a hammer over spring break—how many teens can say that!? Over spring break, I did something a little different than most of my fellow exchange students. I had an awesome opportunity to serve the community. I went on a weeklong school trip to South Carolina to volunteer for Habitat for Humanity, which is dedicated solely to building houses. We helped with flooring and decking. This was one of the most productive and best weeks of my exchange year so far. Through this trip, I gained a lot. I saw myself growing and did things I had never done before. This trip made me realize how thankful I should be for everything I have, because not everyone in this world has a place to live or food to eat. I not only got 40 hours of community service, but the sense of accomplishment and feeling of helping others made me feel better and proud of myself and my teammates. I know I made a difference, and someone will be living in that house very soon.